3-year-old girl was spotted playing with an 8-foot python. What happens next was SHOCKING! Home / Life / 3-year-old girl was spotted playing with an 8-foot python. What happens next was SHOCKING! It is for real that most children, especially girls, spend their childhood playing dolls, playhouse and other games with their friends. For some instances, there are children who grew up playing with their pets. People claim that children who grew up with their pets tend to be the most caring children. But then, would everything still be the same when you realize that the pet that your child grew up with is actually a reptile? This 3-year-old girl was filmed by her parents while she was playing with an 8-foot Python. A lot of people were shocked and at the same time amazed by how this little girl bravely touches and hugs the 8-foot python. The baby was even spotted playing with the snake using her toys. 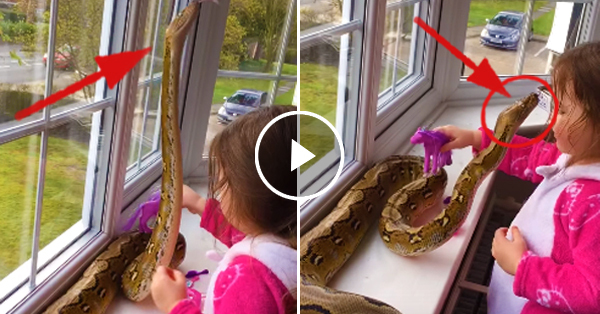 However, there are some who reacted negatively in this video by saying that children at her age shouldn't be playing with snakes despite that it was their pets.